The Mormon Battalion left Council Bluffs, Iowa to fight in the Mexican War. Their first stop was Fort Leavenworth, Kansas to be outfitted with some military equipment. From there they marched 2,000 miles to San Diego, California. They arrived just as the war was ending and had moved back into Mexico. Being no longer a direct threat to the United States the Mormon soldiers were discharged in July 1847 in San Diego and began traveling to their new homes in Salt Lake City, Utah. A small group commanded by Captain Daniel C. Davis re-enlisted for 8 months. The newly formed Mormon Volunteers were responsible for patrolling Cuidad (City) de los Angeles, San Diego, San Luis Rey Mission, and the surrounding areas. They were to protect the citizens from Indians and Mexican raids until both governments could sign a treaty. By 1848 approximately 35 Mormon soldiers headed to Salt Lake City, Utah accompanied by Captain Davis, his wife Susan, and her son Daniel. They made camp at Bitter Springs (Aqua de Tomoso) in April 1848. Jefferson Hunt, a member of the party and a former Captain in the Mormon Battalion, named this spring "Bitter Spring" because of the alkali in the water that gave it the bitter taste. He noted the name on his map and the name remains today. The importance of the Mormon Volunteers passing through this region is that they were the first U.S. military forces on what is known today as Fort Irwin. Captain Davis brought the first military covered wagon drawn by mules into this area along with the first military flag “Mormon Batalion” (note spelling). The Native Americans had never seen a "white" woman or boy before and their strange clothing. They keep their distance. 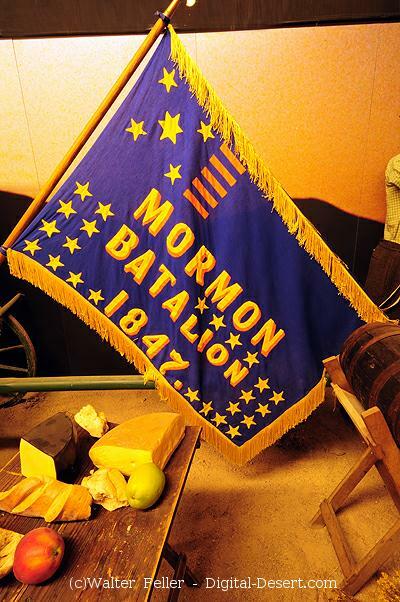 The Mormon Battalion is unique because it represents the only U.S. Military Battalion to have been raised based solely on religion. The flag has five orange bars representing the 5-infantry companies and 28 stars representing each state in the Union as of 1846. The migration of Mormons to and from Salt Lake City through San Bernardino to San Diego re-established the Old Spanish Trail from Santa Fe to Pueblo de los Angeles in part by developing a branch trail that quickly became known as the Mormon Trail.